Moscow, December 19, Interfax – Patriarch Kirill of Moscow and All Russia has expressed support for many of Pope Francis’ views. “We pin great expectations on the election of Pope Francis because much of what the Pope formulates today and suggests for the church and the world and society coincides with our vision,” Patriarch Kirill said at a meeting with the president of the Pontifical Council for the Promotion of Christian Unity, Cardinal Kurt Koch, in Moscow. “In the positions of the bishop of Rome [pope] and the patriarch of Moscow there is a lot in common as regards issues that are sources of concern for many people,” he said. As examples of such concurrence, he cited the two churches’ positions on persecutions of Christians in the Middle East and family affairs. He said dialogue between the Orthodox and Catholic churches is essential today. Cardinal Koch passed Patriarch Kirill oral greetings from Pope Francis. “We speak about the fundamental right to live while others speak about the right to abortion. Those are very big contradictions,” he said. He thanked Patriarch Kirill for sharing the Vatican’s assessments of the situation in Syria and for visiting the country in November 2011. Also on Wednesday, Koch met with Russian Deputy Foreign Minister Alexey Meshkov and discussed relations between the Vatican and Russia with him. 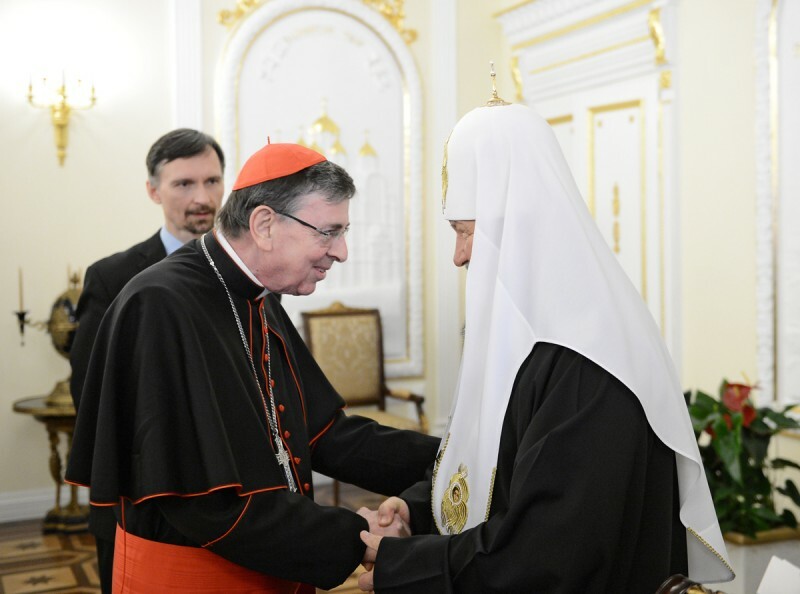 Last month three other senior Vatican officials visited Moscow – Cardinal Paul Poupard, president of the Pontifical Council for Culture, Cardinal Angelo Scola, archbishop of Milan, and Archbishop Vincenzo Paglia, president of the Pontifical Council for the Family.